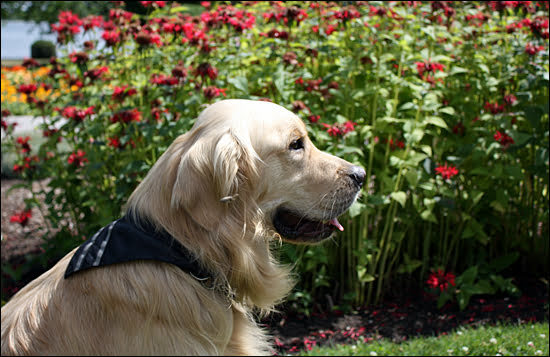 Canine ambassador Monte is the star attraction at Chateau Montbello. 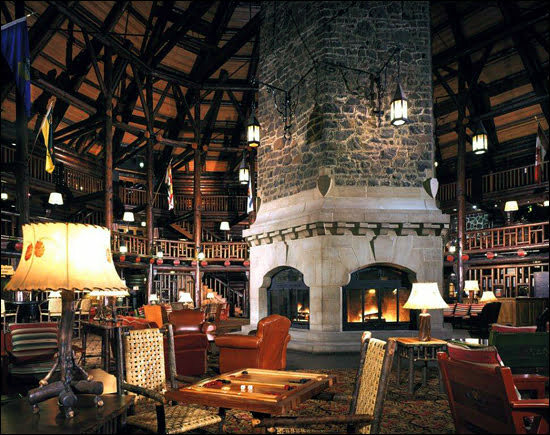 The 80-foot fireplace at the Chateau Montebello is a mesmerizing feature at the hotel. MONTEBELLO, QUEBEC — Before I have even checked into Fairmont Le Château Montebello I’m greeted by one of Quebec’s most popular ambassadors. And no, I’m not referring to Celine Dion or William Shatner. The hotel’s canine ambassador, Monte, a golden retriever originally trained as a seeing-eye dog, makes his home here in Montebello, which dubs itself the world’s largest log cabin. He zips over and says a quick hello before heading off to play with another group of people who have ventured to this opulent hotel on the north side of the Ottawa River that manages to maintain a rustic ambience. Montebello has hosted numerous luminaries, including royalty, British prime ministers and American presidents. One of the first things that will catch your eye in this hotel — besides Monte — is the giant six-sided fireplace that was built as the centrepiece of the lobby. To get your mind around this structure just keep thinking of the number 80. Built with stones from Quebec, this masterpiece weighs 80 tons, is 80 feet tall, and burns 80 cord of wood annually to keep the fires going during the cooler months. There’s lots of room to chill out in front of this fireplace — just pick a spot on a comfy chair on one of the three levels. The fireplace may stand out in this room, but it’s Monte who is stealing the show. Children are going wild over this canine Justin Bieber, and Monte is clearly in his element, enjoying the attention near his doghouse in the sprawling lobby of the historic building. Adults love Monte too, and guests can take him out for a walk on the expansive hotel grounds. Monte is a perfect fit for this hotel, which blends a warm “just-visiting-my-best-friend-up-north” feel with the wonderful “just-want-to-let-go-and-bask-in-luxury” experience. Along with fun with Monte, there are many activities you can participate in (including several interesting things to do during each season). In fact, if you’ve always wanted to give some iconic Canadian activities a try but never had the chance or courage to do so, Montebello is an outstanding place to start, because of the guidance offered. During my stay, I had a chance to pick up a curling rock for only the second time in my life. Yes, you read that correctly — this hotel has its own curling rink. In front of a group of about 20 giggling and pointing children, who clearly enjoyed watching my impression of a giraffe on ice, my extremely helpful guide patiently broke down the finer points of the sport. I’ll never be a Sandra Schmirler, that’s for sure, but I think she would’ve been proud of my efforts. From ice fishing to sleigh rides in the winter, to horseback riding and clay shooting in the fall and spring, to canoeing, croquet, fishing, and guided nature hikes in the summer, Montebello is a great place to cross a few things off your life’s to-try list. Also, if you have time during the day, make a 10-minute trip up the road from Château Montebello. 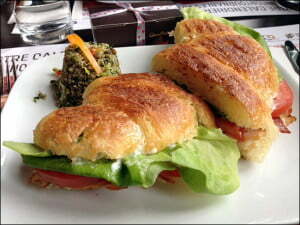 A few minutes from Montebello Hotel in an old train station is Bistro ChocoMotive at 502 Rue Notre Dame. Here you can watch the staff hand make the natural, organic, and fair-trade chocolate that has made the eatery a popular stop in this region. But what’s an even better surprise is the food. Several very good sandwich choices ($8 each) are available, including the Classic bagel with smoked salmon and cream cheese, the Panini with ham and Jalsberg (onion confit with chocolate or artichoke tapenade), or the Smoked Turkey Club Sandwich. But the activity that will leave you feeling most like you’re on vacation is lounging in front of the giant fireplace. While the accommodations at this hotel are lovely, I actually felt most at ease chilling on the second floor, staring at the wondrous giant wood-burning oven and watching Monte at play. The “just-want-to-let-go-and-bask-in-luxury” feeling begins with the dining experience, where executive chef Serge Jost will create several dishes at Aux Chantignoles that are sure to leave you feeling at home as you sit by the window watching the beautiful landscape. Try the Lamb Loin Noisettes, served with ratatouille and potato galette, or the Pan-Seared Québec Trout in a lemongrass broth and with julienne vegetables (both $33). In the morning, be sure and take advantage of the breakfast buffet ($25). There are also barbecue options available ($54). Location: Chateau Montebello is a one-hour drive northeast of Ottawa and a 90-minute drive north of Montreal. Montebello Spa: The luxurious experience at the hotel continues with a trip to the spa and health club, where several treatments are available, including the Great Canadian Customized Facial (60 minutes, $115) and the Rekindling the Flame couples massage (two hours, $420). Visit the spa website for full details and additional pricing options.